Below are common attributes associated to Halcyon Blue Hosta. Become a care taker for Halcyon Blue Hosta! Below are member comments regarding how to plant Halcyon Blue Hosta. No comments have been posted regarding how to plant Halcyon Blue Hosta. Be the first! Do you know how to plant Halcyon Blue Hosta? Below are member comments regarding how to prune Halcyon Blue Hosta. 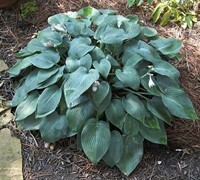 No comments have been posted regarding how to prune Halcyon Blue Hosta. Be the first! Do you know how to prune Halcyon Blue Hosta? Below are member comments regarding how to fertilize Halcyon Blue Hosta. No comments have been posted regarding how to fertilize Halcyon Blue Hosta. Be the first! Do you know how to fertlize and water Halcyon Blue Hosta? Below are member comments regarding how to deal with Halcyon Blue Hosta's pests and problems. No comments have been posted regarding how to deal with Halcyon Blue Hosta's pests and problems. Be the first! Do you know how to deal with pests and problems with Halcyon Blue Hosta? Looking for Halcyon Blue Hosta? Get Halcyon Blue Hosta fresh and large directly from the grower to your garden! Buy Halcyon Blue Hosta online from the nursery wholesalers and save BIG! Halcyon Blue Hosta Lily is one that prefers shadier sites. Some morning sun won't hurt. To plant, dig a hole a two feet or so wide and no deeper than the root ball. If your soil isn't loamy, mix in a soil conditioner or some organic matter at a 50/50 ratio to the native soil removed from the planting hole. Composted cow manure, mushroom compost, or your own homemade compost would be good amendments. Set the plant into the hole you've prepared, making sure the top of the root ball is slightly above the soil level. Pull your backfill soil mixture around the root ball in the hole, tamping as you go to remove air pockets. Then water thoroughly and cover with a one-inch layer of mulch. Halcyon Blue Hosta requires no pruning. Damaged or discolored leaves can be removed anytime during the season. After the plant has gone dormant for winter dead foliage can be removed. I fertilize hosta lilies with a slow-release, natural or organic plant food just when new foliage begins to emerge in spring. There are several insect and diseases that can attack hosta lilies however Halcyon Blue has demonstrated itself to be quite resistant. Deer do like hosta lilies, so plant them where the deer can't get to them. It hasn't showed up in any of the hostas growing in my garden, but there is a new virus called Hosta Virus X (XVX). The virus is usually caused when the plant is cut. Then the sap on your tools from the cut plant can infect other plants. Signs that your plant might have the virus are mottling and spotting on the leaves, or leaves may appear bumpy, or with brown spots or twisted leaves. If you recognize the virus in any of your plants, it's best to remove and discard the plant and don't plant another hosta in the same spot.